Lexicolatry: Borrow - "To Protect and Return"
1(a) verb trans. & intrans. Originally, take (a thing) on security given for its safe return. I met a girl once - a very nice girl who I fancied a bit. 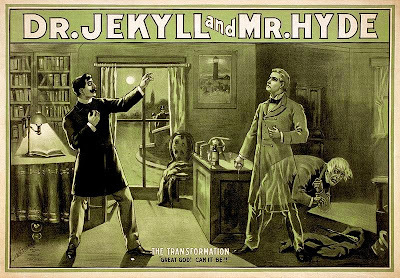 During our first conversation, we started talking about literature, and it transpired that she had never read The Strange Case of Dr. Jekyll and Mr. Hyde by Robert Louis Stevenson. Ever the gentleman, I offered to lend her my copy so that she could borrow it. Now, there's no ambiguity in borrow - the OED is quite clear: "get temporary use of ... to be returned later." Well, some twelve years since she borrowed that book, I still haven't had it back. And Jekyll and Hyde is no War and Peace; no one reads that slowly. And every time I see her, I can't help but think of my book sitting somewhere on a shelf in her house. And I bet she thinks of it too, and yet still she hasn't given it back. In English, when lending something that is particularly valuable or treasured, it's common to say: "Now look after this as if it's your own." That is exactly the opposite of how I want someone to look after something of mine - I want them to look after it as if it's mine, as it is, and if you really think that they'll care for something less if they think of it as not theirs (as it's not), why on Earth are you lending them something in the first place? And the ultimate extension of looking after something "as if it's your own" is to ... well ... keep it. I don't want you to keep something you borrowed from me. It's mine. Give it back. Now, not being one to use Lexicolatry to air my personal (and petty) grievances, it's of etymological note that borrow derives from a Germanic root meaning "to protect, shelter." From now on, if ever I lend anyone anything (and that's a big if), I think I'm going to pull out the OED and highlight this: you're borrowing something of mine, something I want back, and until the moment I get it back I want you to protect and shelter it ... as if it's mine. So, if you're reading this (and you know who you are), can I have my book back please? There need be no awkwardness - just come in, make the drop, and we all walk away clean and get on with the rest of our lives. Oh, and to everyone else: if I've ever borrowed anything of yours and forgotten to give it back, the comments section isn't place to tell me about it. That would be embarrassing, especially if it turns out I've lost it, so don't. Do you have any lending or borrowing horror stories? Does it annoy you when people use lend and borrow interchangeably? If you lend someone something, do you want them to treat it as if it's theirs? Do please borrow freely and leave your plagiarised comments below. I'm very picky with the people I lend things to. They have to be my friend for at least a couple of months, I have to have worked with them (so I know if they're organised and punctual) and I need to see them on a regular basis. Borrowing things from Bibi is kind of like winning an award. That's to say: one that has to be returned in perfect condition in a timely manner. Hope you get your book back. My book's gone, Bibi. I think it's time I moved on. It still hurts, though, y'know? It's not like she borrowed a biro. The guy in the black coat just spotted the lighthouse painting he'd lent to Dr.Jekyll the previous month. Pff. Try twelve years and then we'll talk about you being hard done by, guy in black coat. Pff to you too! I lent out one of The Bobbsey Twins books which was a birthday present before I hit my teens. I think the lesson is never lend anyone anything. Ever. Ever, ever, ever. I'd check, but ... oh ... I can't. Hey Ed could you borrow me your "Catcher in the Rye" when you're finished? Not funny, Nerd. There are some things you just don't joke about - misusing 'borrow' and 'lend' is one of them. And no you can't. I take your four years and raise you eight. At least you got it back (I think).